From climate and damage monitoring to a systemic and integrated approach. The concept of Preventive Conservation has successfully introduced the knowledge that “prevention is better than cure” into heritage conservation. The main benefits of this approach are the cost-effectiveness, the improved protection of heritage values, the reduced risk for accumulating deterioration and additional damage, the prolongation of the physical service life of buildings and building parts and the empowerment of local communities in dealing with heritage. Increasingly, arguments rise against reactive treatment patterns, which result too often in postponed interventions, i.e. a high cost of restoration and increasing demand for funding. Therefore, the WTA-PRECOM³OS conference will focus on preventive conservation approaches, including climate and damage monitoring, and how to implement these monitoring tools within a systemic and integrated approach. 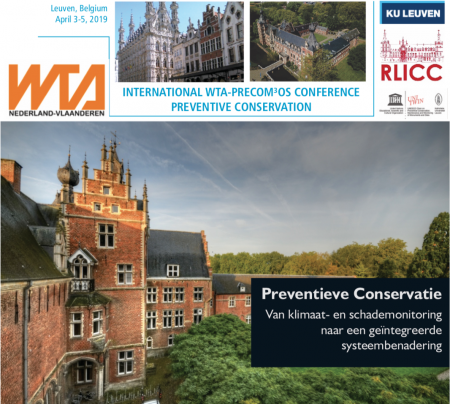 The symposium is jointly organized by WTA-Nederland-Vlaanderen, the Raymond Lemaire International Centre for Conservation (RLICC) and the Civil Engineering Department of KU Leuven, in celebration of the 10th anniversary of the UNESCO Chair on Preventive Conservation, Monitoring and Maintenance of Monuments and Sites (PRECOM³OS).